I made a vow to use my vacation days this year. All of them. I booked this Northern California adventure on one the coldest of days in January, wrapped in a wool blanket as yet another blistering snowstorm whirled outside. My brother and his wife live in South Lake Tahoe, and a summer trip to the mountains and the lake seemed like the perfect winter antidote. 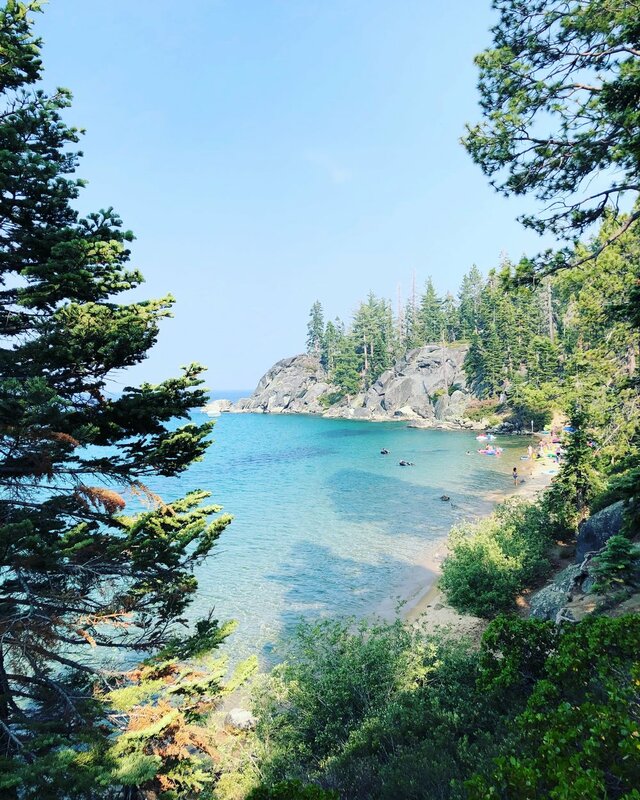 I’ve always wanted to attend the Wanderlust Festival, a yoga and music fest held at Squaw Valley in North Lake Tahoe, so we planned around that! John and Greta picked me up from the airport late on Tuesday, even when my flight was cancelled and I was re-booked to arrive in Sacramento—two hours away. (Thanks, guys!) After the obligatory In-N-Out Burger trip, we pulled off the side of the road at a clearing looking out on Lover’s Leap to stargaze. The sky was a dome spattered with stars and the Milky Way stretched as far as I could see. It looked like a painting. On Wednesday we packed the car to the brim with camping gear and made our way to D.L. Bliss State Park. 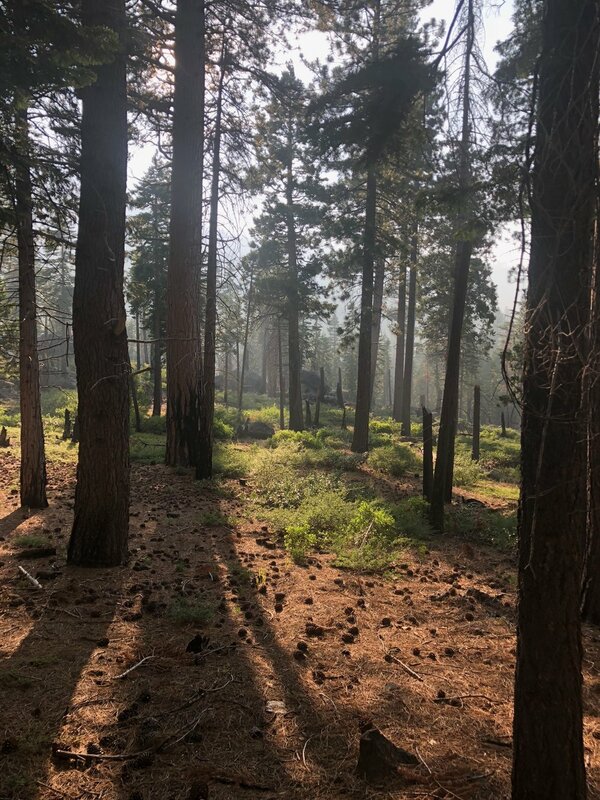 The original plan was to sleep under the Half Dome at Yosemite, but the wildfires had smoked us out. I was a happy camper, nonetheless. 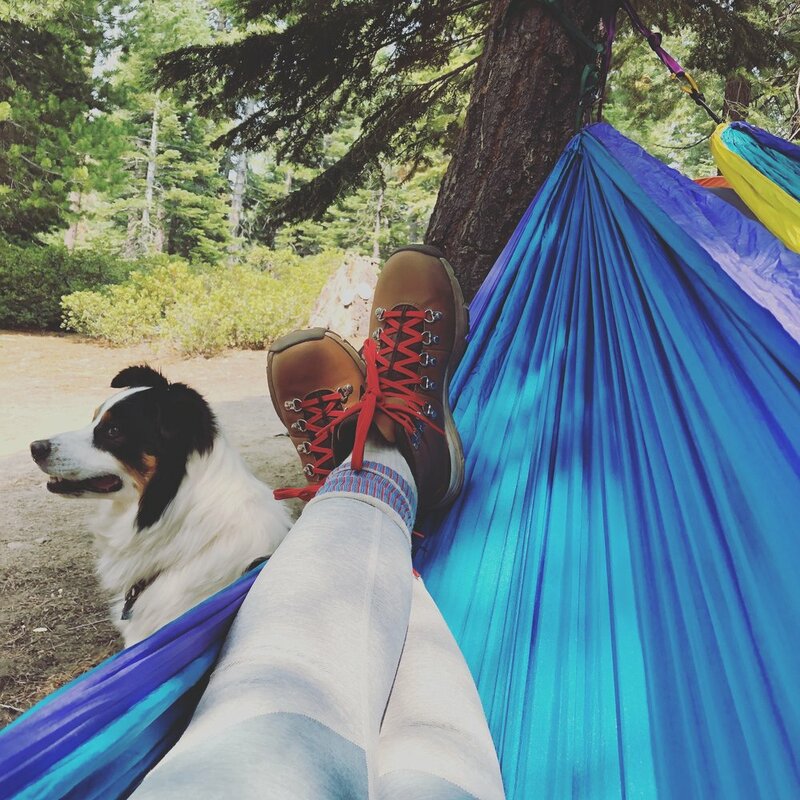 We pitched the tent and set up a little village of hammocks and locked our food in a bear box (!) before making our way to Lester Beach. We hiked through Jeffrey Pines and past the little Rubicon Point Lighthouse, which has the highest elevation of any lighthouse in America standing at 6,300 feet above sea level! The water at Lester Beach is cerulean blue. Its so clear you can see your toes underwater. The beach was like a little secret paradise, a stretch of sand hugged by towering pines. We returned to our campsite and John made a steak dinner with the camping stove. We built a fire and played board games and it was exactly everything I’d wanted for my very first camping adventure. The next morning, after packing up camp, we hiked the nearby Cascade Falls Trail. Ralston, John and Greta’s steadfast Australian Shepherd, led the way through the a winding forest path and over boulders. At the top, we sat on an outcropping of granite rocks overlooking waterfalls, Cascade Lake, and Lake Tahoe beyond. That night we drifted on floaties listening to a concert at Lakeview Beach from the water. On Friday, Greta and I prepared for the lynchpin event—Wanderlust! We drove to North Lake Tahoe to Squaw Valley resort, the host site of the 1960 Winter Olympics, for the weekend yoga extravaganza. We set up camp in the Squaw Valley parking lot, in a sea of RVs and car campers. From the tent you could see the gondola ascend over the mountain peaks. That night we listened to the Wanderlust House Band, dancing and cartwheeling in a field below a sky of stars. I started the weekend with a music meditation hike. I followed musician Garth Stevenson and his double bass up a mountain. Dozens of people gathered at a plateau, and Garth improvised music while we sat in quiet stillness. He was grateful for the attentive audience—he usually plays his music in nature to a raft of penguins or sunbathing sea lions. For real! I was so relaxed listening to the birds hum and the music fill the mountain air. My hometown friend Jess was there, too, it was surreal. What a small world. I joined Greta for another meditation session, and we listened to this incredible group of acappella singers called Beautiful Chorus. Then we took the gondola for a 2,000-foot ride 550 feet above the mountainscape to High Camp for an Amplified Yoga class. The class was indeed amplified—our yogic experience was accompanied by a live DJ! Donovan Vriens-McGrath led us through an incredible mental and physical and emotional journey. We danced out our fears, shouted out mantras, awakened our seven chakras, made promises to ourselves, and left past regrets on the mat. It was the most invigorating and soul-awakening experience I think I’ve ever had. That afternoon we went to a pool party at an elevation of 8,200 feet. We sat in the hot tub overlooking panoramic views of Lake Tahoe and mountain peaks. Then we closed out our yoga day with a yin yoga hip opener class. The instructor demonstrated the proper alignment for certain poses using a skeleton named Norm. We sat in pigeon pose and frog pose and dragon pose and all the poses that hurt until they feel good. John joined us that evening for the music portion of Wanderlust. We danced to MarchFourth!, a marching band and performance group from Portland with an amazing horn section, cheerleaders, and inflatable dinosaurs. Our last hurrah was to the silent disco. Yes, silent. I thought we went to the wrong tent because I didn’t hear any music—but three DJs were stationed at the front and the crowd was bopping to music in their headphones. You could switch between the three stations. It was fun! On Monday evening we went to the Lake Tahoe Shakespeare Festival at Sand Harbor Beach for a performance of A Midsummer Night’s Dream by the Sierra Nevada Ballet. A rainstorm cleared and the skies opened just before the show. 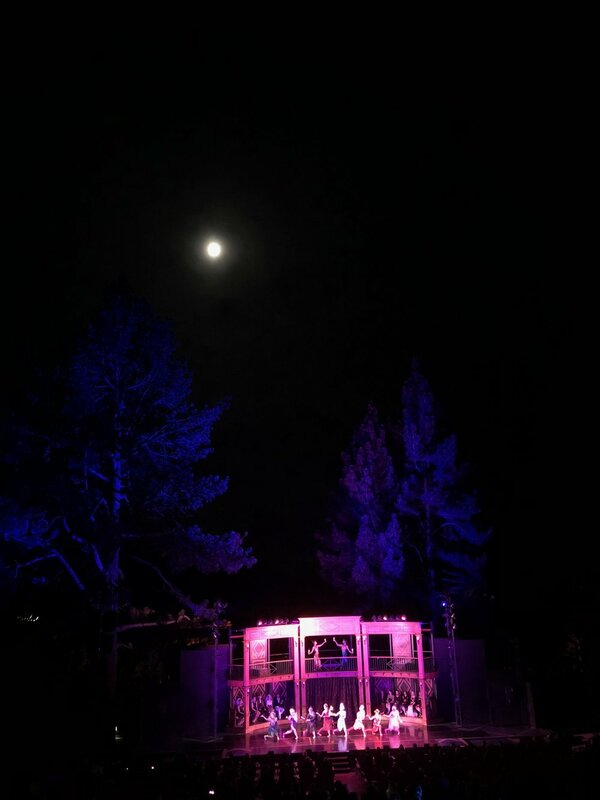 The outdoor stage is framed by towering Ponderosa pine trees and set against the awe-inspiring backdrop of the lake. I thought the plot would be hard to follow without words, but the story of love potions and spritely fairies transferred beautifully to ballet. On Tuesday, we went on a three-hour paddle boarding excursion. We followed a brood of baby ducklings in the teal water and stopped to explore a field of wildflowers just beyond the beach. My shoulders were on fire, but it was a fun workout! Our final adventure was to Zephyr Cove Stables to ride horses! On the tour, you could see the lake through the trees. It was so different from any horseback riding I’ve ever done in Pennsylvania—I’ve always been sequestered inside a corral. Here the horses traversed the rocky terrain, winding through a narrow hillside path. My horse’s name was Petey, and he was the mischievous one in the group. He kept wandering off the path to gather snacks and running ahead of the guide. I thought he might gallop up the mountainside! My trip was bookended by a final trip to In-N-Out Burger. We drove to the Reno airport as the sky turned blush pink. It was hard to say goodbye to John, Greta, Ralston, and the beautiful mountains. Until next time! We stayed in an Airbnb in the the Cannon-Elliotborough neighborhood, a cute white house with a red tin roof just two blocks away from the bustling main thoroughfare, King Street. We rode bicycles around the streets, admiring the historic homes with front-facing piazzas, gaslit lanterns, and brightly colored doors. On our first evening, we had dinner inside a beautiful old bank building at The Ordinary, where we ate the aforementioned stone crab claws and crab toast and barbecue shrimp. We walked off our dinner at the Charleston Waterfront Park and paid a visit to the Pineapple Fountain. We sipped cocktails atop the Vendue Hotel at a rooftop bar overlooking the harbor as the sun set. The sweltering heat didn’t stop us from walking more than 7 miles the next day. We popped into the many specialty shops, boutiques, and galleries in downtown Charleston for a reprieve from the rising temperature. We met with my friend Maura from Critic Camp and her family to catch up over frosé at Bakehouse! We strode along the famous Rainbow Row, the longest cluster of Georgian-style row houses in the United States. The houses are painted in cheery pastel hues, I liked the eggshell blue best. We ogled at the mansions at the tip of the peninsula, and sat in the shade of the live oak trees in White Point Garden. We ended the night at Fleet Landing, a seafood restaurant on the waterfront, where kids played corn hole out front and sailboats glided past in the background. The next morning we got a special backstage tour of the Dock Street Theatre, the first building to created solely for the purpose of theatrical entertainment in America. Built in 1736, and later destroyed in a devastating fire in 1740, the building housed the Planter’s Hotel before being converted back into a theatre in 1809. It is now home to the Charleston Stage and presents theatre and opera performances during the annual Spoleto Festival. For lunch we went to Husk Restaurant, a hotspot from popular Charleston chef Sean Brock, for some Southern fare. We then boarded a boat to visit Fort Sumter National Monument in Charleston Harbor. It was amazing to see the big bellies of the cannons, and to squint across the harbor and imagine how the cannon balls were shot more than a mile away to the faint outline of Charleston, marking the start of the Civil War. For dinner we went to FIG (Food Is Good), which was my favorite meal of the trip. I’m still thinking about the gnocchi that we ordered, per the server’s recommendation, because she said the pasta felt like little pillows on your tongue. She was right. And I’m still thinking about the yellow cake topped with pecan ice cream and fresh peaches that I devoured for dessert. On our fourth day, we woke up early for hotcakes and grits and bacon at Hominy Grill. Then we drove 15 miles to Middleton Place. The rice plantation sits on the Ashley River and was built by planter John Williams in the 1730s. The entrance was lined with live oaks draped in Spanish moss. It was harrowing to see the list of names of the slaves who once toiled the land, which was printed and hung in Eliza’s House—a small slave cabin where Eliza Leach lived until she died in 1986. We walked through the stable yards and fields where sheep huddled and Clydesdale horses puttered in the hot, hot heat. We toured the Middleton House, or at least the house where the original homestead once stood. It was burned during the Civil War. The house museum was filled with artifacts from European Grand Tours, family portraits, and collections of shiny silver. The dining room held a table where Lafayette once dined. I started to sing “Guns and Ships” from Hamilton, the 90-something tour guide didn’t seem amused. We wandered through the maze of gardens, with circles of camellia and hydrangea flowers and perfectly manicured bushes. The gardens stretch more than 65 acres! My mom squealed at the site of alligators, perched as still as statues near the ponds. My dad was delighted for the photo opportunity. There were also white egrets and a family of swans wading in the waters. Perhaps the most fun was had at a BYOB candle making class at Candlefish in downtown Charleston on our final night. 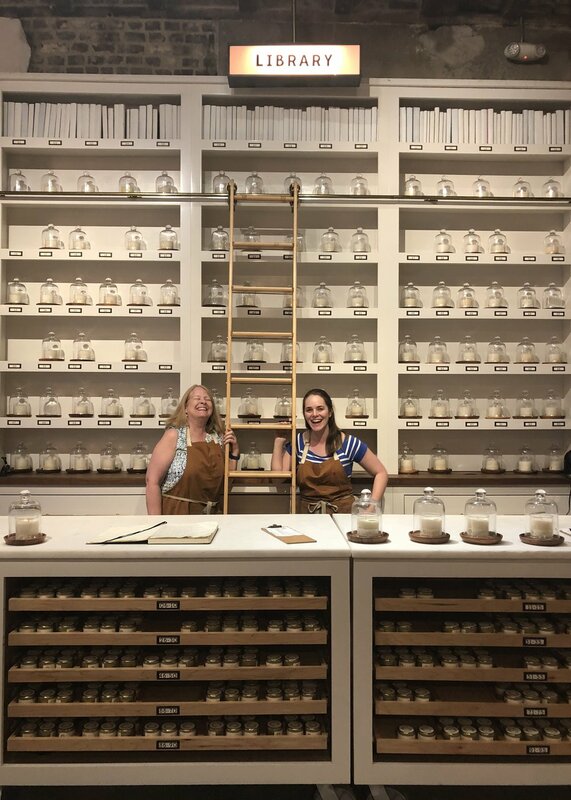 My mom and I drank rosé and sniffed the aromas of more than 25 candles, deciphering the fragrance notes and selecting our favorites from Candlefish’s library wall of scents. We landed on a fragrance of grapefruit and bergamot, and a combination of cucumber, peach, and tomato leaves—a choice that surprised us both! We measured and poured the oils and the soy wax, and learned about the importance of using paraffin-free wax and how to properly care for candles. By the end of the night we were officially “chandlers,” as pro candlemakers are called, and proudly picked up our creations the next morning after they set. After the class, we met my dad at 167 Raw for lobster rolls. The wait was too long for a table, so we ordered lobster rolls to go an unabashedly inhaled them on the sidewalk. Yum. Our last hurrah in Charleston was a tour of the Edmondston–Alston House along the battery. The house had beautiful woodwork, I especially loved the library with its walls of book shelves and a writing desk with views of the harbor. We stood on the second floor of the piazza, where General P. G. T. Beauregard watched the bombardment of Fort Sumter on April 12 in 1861. We ended the tour bouncing on a joggling or jostling board, a long piece of pliable wood that sways side to side. We learned that it was designed to mimic the sensation of riding a horse, and if two people jostled their way to the center and their bodies touched, they were to be married. We stopped to visit the 400-year-old, majestic Angel Oak tree on our way to Kiawah Island, where we spent the last few days of our trip. Kiawah Island is a private island with beautiful wooded grounds south of Charleston. We rode bikes down the winding tree-covered paths and read books in the sand and watched the sun set in the sherbet sky. On the last day we drove to the nearby Wadmalaw Island to visit the Firefly Distillery and Deep Water Vineyard. I strolled through the rows of grapes, swang on a tree swing, and sipped sweet tea vodka and lemonade. I convinced my parents to drive a half hour for fried chicken sandwiches at Boxcar Betty’s for lunch—they were topped with peach coleslaw and oh, so worth it. Our final evening, we walked down the beach to The Sanctuary Hotel, a colossal luxury hotel that looks like the most perfect seaside mansion. We sat in big Adirondack chairs on the hotel porch, looking at the stars, drinking cocktails, and wishing vacation could last forever. Until next time, South Carolina! My first big girl purchase was a cranberry colored, Kate Spade bowler bag. Its pebbled leather, marked with a signature golden spade, accompanied me to my first job interviews. The pockets of its interior were ready to be filled with notepads and meeting agendas and file folders. As I carried it, I felt like I was being carried into my future. It was the perfect comfort, and a necessary accessory to bring with me over the precarious bridge from college to career. It's these zappy phrases and inspiring slogans that bring the playful wonder of the Kate Spade lifestyle brand to life. “Make Every Day Saturday” and “She is quick and curious and playful and strong” are posed on tumblers and tea pots and phone cases, illuminating the quotidian events of life. The delightful novelty purses shaped as flamingos, pineapples, and ice cream trucks make me smile. My personal collection now even includes a bed sheet set, bespeckled with blue dots, on which I have spent many weekend mornings unabashedly practicing my favorite Kate Spade mantra: “Eat Cake For Breakfast.” The brand is in part a marker into adulthood for young women yearning to carry the iconic bags—and a fanciful reminder that #adulting can be fun, too. In short, I’m thankful for this whimsical world that Kate Spade has created. Her vision to craft a simple handbag, and the billion-dollar business that bloomed thereafter, is inspiring. The bags are a rite of passage of sorts for young women looking to build something of their own. And in a time where capsule wardrobes and closets of beige and black are the goal, my splashy Kate Spade accessories and home goods remind me to “Live Colorfully,” and with purpose. Last week I traveled to Miami for three days by myself. I had vacation days to use up and an urge to see the sunshine after this endless New York winter. I think my parents were a little hesitant to grant their blessing for my solitary adventure—and with good reason. A few years ago when I was studying abroad, I took a day trip by myself to Ennis, Ireland that ended with me hitchhiking with an old man from a cemetery back to the city center along winding, dark roads. I lived to tell the tale. But I was surprised at how quick I was to change the outline of my schedule, how quick I was to act on impulse. I volleyed from the hotel pool to the ocean, from reading in a hammock to biking down the Miami Beach Walk. There was no deliberation, no compromise—I just did what I wanted exactly when I wanted. A poolside margarita! An order of french fries! A dip in the ocean! On my first day, I ventured to Joe’s Stone Crabs for a plate of claws. The cold, white crab meat fell out of the shell with a swift crack. The lumps of crab, buoyed by a teeny fork, swam in a pool of mustard sauce. I didn’t have to share one bite, and this lunch will hold the title of best lunch ever for all time. Armed by my derm with Zinc Oxide, I lathered on a protective shield to combat ultraviolet rays and spent the afternoon in the sunshine. (I didn’t get burned this trip, which is a huge feat for me!) The hotel pool was a paradise lined with a canopy of palm trees. A tiled fountain flowed into the deep end, and the outdoor patio was guarded by white cow and sheep sculptures for a bizarre pastoral aesthetic. A short walk down a path led to the ocean. The hotel staff, like toreadors, threw yellow and white-striped towels to the wind and laid them flat on cushioned lounge chairs in the sand. I sat like a queen on my perch above the ocean. That night I put on a floral floor length dress and went to Byblos, a Mediterranean restaurant in the Royal Palm Hotel. I treated myself to rosé and a dinner of octopus and a bowl of saffron couscous. Afterward, I went to Pao by Paul Qui at the Faena Hotel for a cocktail and dessert. The hotel lobby has a red carpet flanked by floor-to-ceiling murals of tropical birds and monstera leaves. A spiral staircase lit with starburst chandeliers leads to the restaurant, an oval room with gold leaf on the ceiling. The dining area is anchored by a giant gold unicorn, which the bartender informed me cost $6 million! I sipped gin and elderflower and ate Halo-halo, a Filipino dessert with almond milk mochi, shaved ice, and candied mangoes in a bath of berry water. Before heading back to my hotel, I walked outside to see another golden statue—a gilded skeleton of a woolly mammoth lit inside a glass box. He illuminated the dancing silhouette of palm trees against the night sky. After a morning on the beach, I went to the Museum of Ice Cream. The entrance to the flamingo pink building was decked with fuschia-colored palm trees. The first exhibit was a pool filled with sprinkles, and museum-goers were invited to jump into the lagoon of rainbow jimmies. My favorite room featured a giant banana swing, I swayed while eating a chocolate covered frozen banana. Other sweets included a hot pink cartoon of melted ice cream, a cherry-topped sundae with strawberry whipped cream, and key lime pie ice cream in a sugar cone. With a sugar high, I left to catch a train to Boca Raton 50 miles north. When I heard that the Parkland students would be mounting a production of Spring Awakening during my time in Florida, I knew that I had to see it. I shared a table with the musical’s composers, Duncan Sheik and Steven Sater. I watched as they watched their work, which was inspired by the Columbine tragedy, take on a new life at this black box theatre. We laughed as the students danced about the space singing the f-word with coy satisfaction. We cried as they fell to their knees in a graveyard scene, grieving for friends gone too soon. I started the next day saluting the sun with a yoga class on the beach. The rays played peek-a-boo with a chain of clouds as I held a warrior pose. I walked along the beach afterwards admiring the brightly colored lifeguard towers. My next stop was the Wynwood Arts District. I wandered through the neighborhood admiring the artful graffiti and muraled walls, feeling alone for the first time. A very nice Midwestern couple took my photo. I ate lunch at the famed Zak the Baker Deli, and the barista slipped an almond croissant into a to-go bag with the chocolate chip cookie I ordered. Maybe he thought I was cute. But I think he felt sorry that I was by myself. My last hurrah was the Vizcaya Museum & Gardens, a beautiful villa and estate once owned by businessman James Deering in the Coconut Grove neighborhood of Miami. It was a palace on the water, each room more decadent than the last, surrounded by a maze of well-groomed plants and flowers. My favorite part was the stone barge in the ocean, which was built as a breakwater to protect the house. It looked like a party boat fit for mermaids. Throughout my trip, I kept feeling like I was being too self-indulgent. But walking through the jungle-like foliage of the gardens, I decided I was enjoying my own company and I thought of my self-sufficient cousin Corey. She was killed in a tragic accident a few years ago at the age of 28. She would totally have approved of this self-love trip. As if to show her support, that afternoon when I returned to the hotel, I was surprised to find that the wonderful young woman who would have been her sister-in-law was staying there. A few years ago, Corey was so excited for the two of us to meet. And here we were, randomly at the same boutique hotel on the same island sharing the same afternoon. Corey’s sister later told me that a few months before she died, she ventured alone to a fancy hotel on the beach in California and spent her time swimming and journaling by the pool. So I decided that this trip fell under the category of self-care, and that celebrating myself wasn’t indulgent but truly necessary. Life is too short to not use up expiring vacation days. And it's definitely too short to refute that fifth ice cream cone. I saw my first opera in the Czech Republic when I was seventeen years old. My high school madrigal choir was traveling to compete in an international competition, and our tour took us to the Czech Republic, Hungary, Slovakia, and Austria. (We took home the top prize!) After a long day of rehearsals in the city of Olomouc, we slunk into the red velvet seats of the 1830 Moravské divadlo Olomouc opera house to see Giuseppe Verdi’s Nabucco. The surtitles were in Czech. I didn’t quite follow the plot, but I marveled at the elaborate set pieces and the heavy, ornamented costumes. I watched in amazement as the tiers of Solomon’s temple flew above the stage, and as fire ignited along the footlights to illuminate a battle scene. It was all so grandiose—the opera house, the music, the drama. Much to my surprise, the audience burst into song in the Third Act. The crowd of well-dressed patrons joined in on the famous chorus “Va, Pensiero," and it was kind of magical. I didn’t return to the opera for seven years, and now I’m on a roll seeing contemporary operas. Many luminaries in the theatre world develop and direct operas, and in my recent trips to the opera I have found that the form mirrors contemporary musicals in surprising ways. Arias in operas are much like the "I Want" songs in musicals—characters step aside to reveal their innermost feelings. The songs can be indulgent, emotional, and don't have to drive the plot. This emotional storytelling can also teach the audience how to listen to subsequent recitative songs. In December, I went to the Metropolitan Opera for the premiere of Kaija Saariaho’s L'Amour de loin. It was opening night, and women ascended the stairs of the Met with their gowns trailing behind. Men were dressed to the nines in tuxedos. And there was such excitement bubbling about the premiere—it was the first staging of an opera by a female composer at the Met since 1903. (Which was staggering to me and didn't seem like cause for celebration, but I happily attended the celebratory post-show soirée anyway.) Surtitles for the French-language libretto by Amin Maalouf were neatly displayed on the seat in front of me, but my eyes were transfixed on director Robert Lepage’s staging. The sea separating the opera’s long distance lovers—the Prince of Blaye and the Countess of Tripoli—was brought to life with rows of twinkling, tubular LED lights. They seemed to stretch upstage forever, rising and falling with the billow of the baritone’s voice. It was mesmerizing, and so beautiful. In September I saw the world premiere of the “hiphopera” We Shall Not Be Moved, by Daniel Bernard Roumain and Marc Bamuthi Joseph, at the Wilma Theater in Philadelphia as part of the Opera Philadelphia’s O Festival. The performers soared through spoken word, hip hop, and opera singing—all directed and choreographed by Bill T. Jones. The opera follows a group of displaced North Philly teenagers who find refuge in the exact location of the MOVE organization, the black liberation group that was bombed by the Philadelphia police in 1985. It was a dark slice of history, folded into the harrowing present, and told through beautiful projections and words. Earlier this month, I ventured to BAM’s Howard Gilman Opera House in Brooklyn for the first time to see Crossing as part of the Next Wave Festival. The opera was composed, written, and conducted by 27-year-old Matthew Aucoin, and directed by Diane Paulus. The English libretto was inspired by excerpts from a diary that Walt Whitman kept while volunteering as a Civil War nurse. It explores the line “What is it, then, between us?” in Whitman’s poem “Crossing Brooklyn Ferry,” taking it so far as to imagine a relationship between the author and a patient at a Washington, D.C.-based Union hospital. The set was a one-room ward filled with varying shades of Prussian blue, the color of the Union Army uniforms. Projections of the outside world fluttered across the shiplap walls, and soldiers moved about the space dancing as waves and shifting as wind, all while the lines between good and evil, and life and death, criss-crossed and blurred. It brought forth a divisive period of U.S. history, all while shedding light on the discordance in our country today. I’m struck by how the images from the operas I have seen—a towering wall, strings of lights, fires blazing—have cemented in my brain. Opera is as much a visual form as an aural experience. It offers the perfect mold for over-the-top, operatic spirited characters, and gives virtuosic artists freedom to explore. I'm excited to see hip-hop dance moves and diverse casts and current events finding a place in opera houses. While at the Philly Fringe, I happened upon an outdoor screening of Mozart's The Marriage of Figaro and was unable to find a seat on the three-block long Independence Mall. Hundreds of people of all ages watched and sang along. It was another magical moment. I'll happily add more trips to the opera to my calendar of regular theatre outings. Happy 7th Anniversary, New York! The building I now work in on 36th Street was once the destination of many trips from Pennsylvania. My parents and I would drive for hours into the city for auditions, sometimes multiple times a week. We’d stand in line to get our photos taken in the lobby of 520 8th Avenue and wait to collect a visitor's pass to ascend the elevator to Ripley Grier Studios. Now I bypass the line with my office i.d. and ride the elevator with kids that look all too familiar—with sheet music in hand and nervous parents in tow. Sometimes I’m reminded of auditions I had in the building as I pass the 16th floor. One that is particularly haunting was a dance call for the remake of the movie Fame when I was fourteen—I spread my arms wide clocking the girl next to me when I should have been turning. Mandy Moore (the famed choreographer, not the pop star) quietly dismissed me. Equally memorable is the time I auditioned for a We The Kings music video when I was seventeen. After I read the sides, the casting director brought my parents into the room. To improvise a scene. The song was called “Check Yes Juliet,” and the Romeo and Juliet-inspired video was about a girl, her rockstar boyfriend, and her disapproving parents. We made up a scene in which my dad caught me sneaking out of the house to see the boy. I remember yelling, “But I love him, Dad!” And my father yelling from across the studio, “How can you love him? He looks like he is dressed for Halloween!” (Which is exactly what my dad thinks of boys who look like they might listen to rock music.) We didn’t get the roles. After auditions, I’d resort to my trusty blue binder filled with restaurants mapped out by neighborhoods, and my dog-eared Zagat Guide, for dinner. Whether an audition went well, or terribly like in the above cases, we always made a point to add something special to the sometimes two minute auditions. Food adventures made the long trip worthwhile, and we ate our way through the city. Looking back, I realize that my love for these frequent, quick trips to Manhattan spurred from more than just the thrill of a great audition. They were equally as exciting because of the cannolis from Little Italy, the bowls of pasta from Ill Vagabondo, and the juicy burgers hidden inside the Le Parker Meridien hotel. So my love affair with New York started long before my parents dropped me off at Pace University for my freshman year of college. It really began when I was seven and stood outside of the Palace Theatre after seeing Beauty & The Beast and declared that I’d live in this twinkling city when I grew up. And it lasted through the eight trips my parents made hauling my life in and out of boxes each semester of college, all while double-parked on busy New York streets. Thanks, Mom and Dad! This week, as I look back on the seven years that I’ve had a New York mailing address, I’m reminded of why I love this crazy city. I went to a heartwarming production of Shakespeare’s As You Like It in Central Park, which featured a cast of professional actors, New York taxi drivers, teachers, and community members all sharing the stage. I attended a secret concert in my neighborhood of Greenpoint, and sat on a colorful tapestry on a warehouse floor listening to beautiful music on a rainy night. I did yoga on the rooftop of the William Vale Hotel with sweeping views of the Manhattan skyline. I went to Smorgasburg for a lobster roll and drank juice out of a pineapple with a straw. I toured the Brooklyn Brewery. I ran a 5k as part of the Wanderlust Festival and did yoga with 10,000 people in Prospect Park as Alicia Key’s “New York” blared through the sound system. Dragonflies flew overhead, the sun was beating down, and I really did feel inspired by New York, just as the lyrics say. This jam-packed week wasn't atypical. I survive on spontaneous adventures, and regularly eat dinner long after the sun sets. I’ve somehow managed to make my love of theatre and my passion of food and culture into a living. While my path has wandered, so many things have stayed the same. For one, I still spend a lot of time at 520 8th Ave. Just on a higher floor. Picnicking at the Hudson Valley Shakespeare Festival before the performance. Two weeks ago I hopped on the Metro-North for a weekend getaway in Hudson Valley, New York. The hour-long train ride was marked with views of the Hudson River, harbors full of sailboats, and majestic cable-stay bridges. My lovely mother greeted me at the Cold Spring train station, and we ventured down the town’s quaint main street and dropped off our bags at a riverfront bed & breakfast. Cold Spring looks like a postcard. Its Federal-style homes dressed with columns and Palladian windows, and its colorful drag of specialty shops and general stores turn back time. That first night, we picked up sandwiches from a deli and drove to the nearby hamlet of Garrison to visit the Hudson Valley Shakespeare Festival. We followed a parade of theatregoers outfitted with picnic baskets, blankets, and bottles to the festival grounds. The performances take place in a 540-seat tent, which is flanked by a mansion and spectacular views of the Hudson River and Storm King Mountain. We passed through a garden of rows of herbs, a fountain surrounded by roses, and then claimed our spot on the lawn for our picnic dinner. Soon it was showtime, and we made our way to our seats inside the massive tent to see Kate Hamill’s adaptation of Pride & Prejudice. Behind the set, peach colored-clouds floated over the West Point castles across the river. The play was fabulous. The audience laughed at the cross-dressing and the hilarity that Hamill brought to life from Austen’s novel. In the morning, we drove north to Newburgh to visit Scenic Arts Studio, a large warehouse where scenic backdrops and sets for theatrical performances are painted. During our visit, Scar’s lair was being crafted for the national tour of The Lion King, and clouds were being painted on a backdrop for the upcoming Broadway production of The Honeymooners. I stood underneath a double-sided backdrop of constellations from the show Cymbelline, which was inflated by a fan. It was beautiful! We spent the day in Beacon visiting the Dia:Beacon museum, giggling at some of the absurd exhibits and admiring Richard Serra’s towering steel cylinders. That evening, we went to a reading of Hamill’s newest work, Odyssey, at the defunct Garrison train station. Brandon Dirden starred as Odysseus! The station rattled as trains passed by, all while the Cyclops Polyphemus stormed the stage. We returned to our bed & breakfast in the pouring rain, and perused realty sites looking at homes for sale—we really didn’t want to leave. We even snuck into an open house the next morning. On that final day, we joined the throng of Manhattanites in hiking gear for the town’s main attraction—its hiking trails. We traversed the 5-mile Cornish Estate Trail and explored the stone ruins of the Northgate mansion, an estate that was destroyed by fire in the '50s. There were butterflies and wildflowers and croaking frogs along the pathway, and we descended the hill and finished our trip with ice cream cones on the riverfront. I can’t wait to return next summer. Thanks, mom! The cast of Damn Yankees! performing "The Game" at the PNC Field in Moosic, PA. The last time I was at the PNC Field was for my friend's 13th birthday party. Her parents reserved a luxury box, which was decorated with streamers and balloons. I was much more interested in the cake than the game happening below. Earlier this month, I returned to my home field (which is the Triple-A affiliate to the New York Yankees) to see the Scranton Shakespeare Festival’s production of Damn Yankees! The show hit a home run in bringing theatregoers and sports fans together for a new—dare I say more exciting—spectacle on the baseball field. Instead of the familiar stadium song to start a baseball game, the musical—penned by Richard Adler, Jerry Ross, Douglass Wallop, and George Abbott—began with a sweeping overture. The company of 24 performers descended down the seating area behind the coach’s first base box singing the opening number “Six Months Out of Every Year.” In it, the women lament that their husbands spend half of the year following baseball, ignoring their household duties and marital responsibilities. The biggest offender is Joe Boyd. A die-hard fan of the Washington Senators team, the aging Boyd (played by Michael Gilbert) spends the six-month baseball season glued to the television screen watching his losing team. “If only The Senators had a long ball hitter we could beat those damn Yankees!” he bemoans. A mysterious character then appears on the TV—aptly portrayed here on the JumboTron—to offer Boyd a deal. Mr. Applegate, played by the devilish Joe McGurl, gives Boyd the chance to transform into the savior that The Senators need—Joe Hardy, a young slugger for the team. The catch? If Boyd chooses to play in the final pennant game of the season, he will stay as Joe Hardy forever. Boyd, a canny real estate agent, requests an escape clause as part of the arrangement. The team's newest player, played by the dreamy Timothy Michael Quinn, arouses curiosity in the town. Quinn's alluring singing voice and muscled physique surely added to Hardy's appeal, and bring hope to The Senators players who make up for their lack of skills with heart. Reporter Gloria Thorpe, played by Juliana Pillets, is skeptical of the newcomer. Pillets led the charge in the first of many catchy group numbers, belting out “Shoeless Joe from Hannibal, Mo. "—her booming voice echoed up Montage Mountain. The mystery surrounding Joe Hardy and his cryptic background begin to unravel as Joe toggles between wanting to return to his wife at home and the temptations thrown at him by Applegate—including the lascivious Lola of the infamous tune "Whatever Lola Wants." In perhaps the most exciting intermission ever, audience members retreated to the food stands for hot dogs, cheese steaks, and pints of beer. Act II began with The Senators spilling over the railing and onto the field for “The Game,” which was the crowd-winning song of the night. The uniformed players spun round, leaped over benches, and grapevined from first to second base—all while real-life ball players practiced in batting cages behind them at the other end of the field. Director Michael Bradshaw Flynn successfully married the traditions of the sport to the athleticism of theatre in this production. The all-star cast stepped up to the plate with dance-heavy numbers choreographed by Matthew Lynady—all of which were perfected in the short span of a two-week rehearsal period. The character of Lola was played with great agility by Mollie Downes, who gracefully dropped into splits and maneuvered her fast feet on the ballfield dirt. The show's oddball number "Who's Got the Pain?" even found its place, showcasing the company's mambo dancing skills—even though the song does not further the plot. It comes as no surprise that Joe exercises the escape clause that he sets in place for himself, even though the musical's mirroring of Faust does keep the audience wondering if he'll sell his soul after all. But Joe returns home to his wife and his middle-aged existence as a real estate agent, happy as can be. The musical—which took home the Tony Award for Best Musical in 1956—surely has a pleasing ending. Even the toddlers seated in front of me were satisfied. The curtain call was marked with a sunset, and audience members made their way to the field's VIP lounge for a celebration of the season’s conclusion. Audible gasps and cheers filled the space as the 2018 summer season was announced. The excitement filled me with hope for my hometown. The sounds of the hummable song “Heart” drifted out of the stadium and followed me into the parking lot. It was thrilling—maybe this is how baseball fans feel leaving a victorious game. Scranton Shakespeare Festival, Damn Yankees! I never went to sleepaway camp. It is funny because I grew up in rural Pennsylvania, which is chock-full of camps in forests with lots of trees and bodies of water for kayaking and paddle-boarding. Maybe I never went because my older brothers were banned from Camp Orchard Hill in my hometown after they demolished two of the organization’s brand-new go-karts. (Which was actually really funny and not as terrifying as it sounds.) Perhaps my perspective of sleepaway camp was tainted after I dropped my brothers off at Camp Woodward in Lancaster and visited the bunk rooms of the bikers and roller bladers, which reeked of sweat. Or maybe it is because my brother shattered his tooth on his bicycle handle one summer there, and I didn’t want to have my own catastrophic trip to the dentist while being away from home. I did have my fair share of summer day camps, though, learning about constellations in science camp, mixing potions in wizardry camp, and even smashing geodes in rock camp. In high school I witnessed the true merit of sleepaway summer camp when one of my best friends demonstrated her ability to change her bra and underwear all without taking off her clothes while we prepped backstage for the annual dance recital at school. She also can french braid her own hair and tie a cherry stem with her tongue, all skills perfected by many summers spent at Camp Kresge in the Pocono Mountains. This weekend, I feel like I’m finally getting a real camp experience. I’ll be venturing to Waterford, Connecticut for the National Critics Institute at the Eugene O’Neill Theater Center. I’ve packed plenty of bug spray, a pair of boat shoes, and saved my dentist's number in my phone. I might be sharing a room with a stranger and there will be a communal bathroom. And while I don’t think there will be s’mores or Kumbaya around a fire, there might be titillating games like “Name That Theatre Critic,” or we might win prizes for filing reviews in a timely manner. And I’m excited. Whatever these two weeks have in store, I’m trying to not worry about my non-critical nature or think about all the things in the theatre field that I don’t know yet. And I’m trying to get over my bad case of imposter syndrome. I plan to go into this experience knowing that I have a lot to learn—and institutes are for learning, right? Who knows, in addition to coming back more opinionated I might even learn how to tie a cherry stem on my tongue.